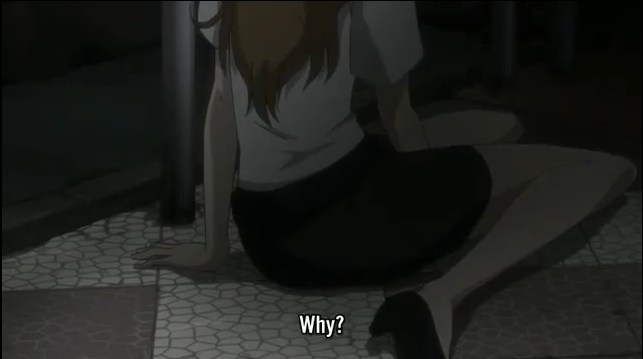 In Steins;Gate episode 9 Hououin Kyouma digs himself further and further into a hole. The first rule, it is said, when one finds oneself stuck at the bottom of a pit, is to stop digging. Hyououin Kyouma, being a mad scientist, doesn’t respect rules. That's what makes Feyris-nyan so deadly. Moments into this episode, Okabe (Kyouma) bungles the basics of information security. Talking aloud about his time machine in a maid cafe, leads to further diffusion of the knowledge about the D-mails. Even when Okabe clams up, Daru is more than willing to spill everything when Feyris asks for it. It seems Feyris has something that she regrets, something she wishes she could change about her past. Okabe makes a disturbing discovery. The IBN computer is missing, or rather, it never was here in the current world-line. At this point Christina tries to get Okabe to slow down and do some real science, which he claims is boring, and unsuited to a mad scientist such as his self. This, I think, is Okabe’s critical flaw. If he slowed down, and methodically checked out half the things he encountered so far, we would have a much better understanding of what is going on. Instead he takes the approach that, if he keeps mashing buttons, something good is bound to come of it. A better question would be: why not? 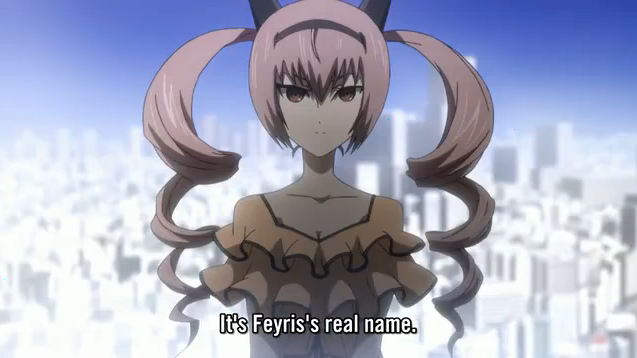 On the way to see Feyris, Okabe sees Moeka, AKA Shining Finger. When he catches up to her, she is distraught, because the IBN isn’t where FB said it would be. Since she doesn’t know where the computer is, he lets her go, but discovers that, in the last World-line jump, Moeka joined the lab (again). And here is what I mean about Okabe not doing the boring work of science. That’s it. He lets her go. He is disturbed that the past can change so much, but he doesn’t do the sensible thing. Moeka is an enigma. Why does she know or care about the IBN computer? Who the hell is FB? Okabe never asks Moeka for information that, even if it turned out to be irrelevant, would help to rule out some of the free-floating question marks. 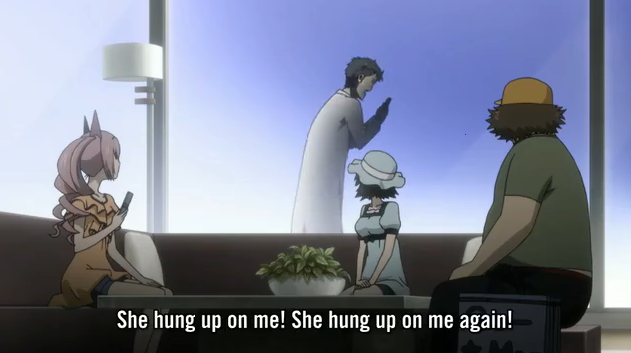 There is a similar moment between Okabe and Christina, in which he finds her crying — something she vociferously denies. Then she starts sobbing into a teddy bear. Maybe Okabe isn’t really interested in her, maybe it would have been tough to get her to open up, but there are some big question marks surrounding Christina as well (notably “why was she murdered?”, and “what caused her to become un-murdered?”). 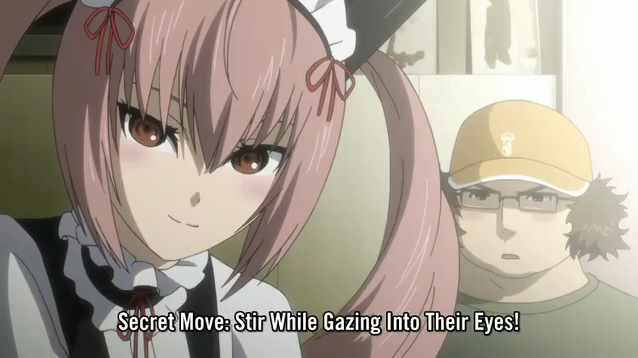 Instead of methodically doing science, Hououin Kyouma (AKA Okabe Rintaro) decides to risk it all once again. This time he lets Feyris send a D-mail 10 years into the past, without even knowing what it contains. When the world-line jump is complete, a new person has mysteriously appeared in the room. The IBN computer is still missing. Furthermore, Akihabara is no longer an Otaku paradise. You see, Okarin? You see what happens when you act on impulse instead of doing the “boring” work of real science? The producers obviously wanted this episode to have impact. They ended it with the overlapping ED trick, that is, the ED plays, but the characters keep on talking, and the visuals are part of the narrative, as Okabe realizes that the maid cafes and doujinshi sellers are gone, Gone, GONE! At this point it is a bit difficult to have faith in Okabe’s ability to guide the future towards one in which humanity is free, as his impetuous button-mashing is causing a dystopia we all seek to avoid. I was really impressed by how the anime staff handled the ED sequence as Okabe was glancing around in panic. Okabe had it right when he said that messing in around in the past wasn’t such a light thing, despite all his gloating and his weird behavior, it’s clear that he understands the gravity of the whole situation. 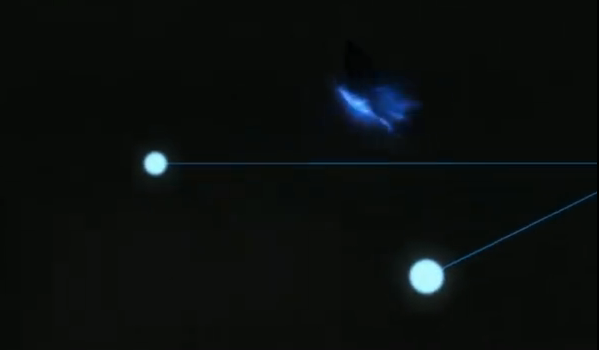 And even more so since he’s the only one to retain memories between world shifts. Yeah. I wonder if Akiba is changed forever, or if another world-line jump can bring back the glory. Okabe neds to start acting from a plan, though. This random stuff is going to get him nowhere good. I suppose he can start sending himself messages to not send this or that message. The biggest risk at this point would be that he does something that causes him to lose the time machine itself. Yay Feyris! I was happy to see her again and damn finally we see some massive changes with time getting changed. I have to say that was a great way to end the episode, now I can’t wait to see what was lost and how they will change things back? Agreed with you Joojoobees the worst he could do now is loose the time machine forever. Okabe better figure out how to restore the doujinshi shops to Akihabara, or he will face the wrath of world-wide otaku-dom.